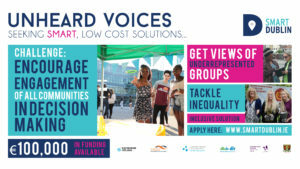 Fingal County Council and Cork City Council seek smart solutions to encourage engagement of the ‘unheard voices’ in decision-making about the future of their place. Speaking about the SBIR Challenge ‘Unheard Voices’ AnnMarie Farrelly, Director of Services, Fingal County Council said: “The initiative provides an exciting opportunity for local authorities to explore innovative methods to inclusively engage and, to also, provide support to different communities of stakeholders in articulating their needs throughout the engagement process. It is hoped that going beyond the range of conventional communication and public consultation methods will help to actively involve all communities in discussions about the future of their place”. The challenge is open for applications until the 11th of June at 12 pm (noon). There was a briefing session for all prospective applicants on the 16th May. It provided the opportunity to discuss the requirements of the brief with Smart Dublin and Enterprise Ireland. See the presentations below.